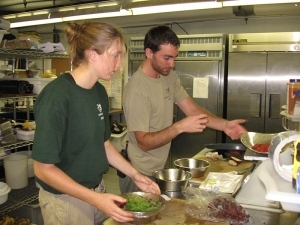 Zoo keeper interns in the Minnesota & Tropics Trails work area learn to provide care for some of the animals included in the Minnesota Zoo’s collections of animals native to Minnesota and animals in the Zoo’s collection of tropical species. Interns learn how to maintain and enrich animal exhibits, support and monitor the health of the diverse species in these collections, and interpret these collections for visitors through demonstrations and presentations. All interns complete an individual project developed in consultation with zoo keeper and zoologist staff.